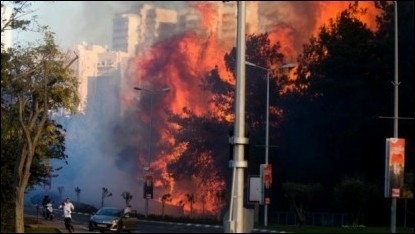 Wildfires sweeping into Israel's third largest city of Haifa last month. The 1,773 fires that ravaged Israel in November may or may not have been started by terrorists, but the arrests of dozens of suspects have inspired pundits to speculate about "arson terrorism" as the latest stage in the evolution of jihadist tactics. If fires that destroyed thousands of acres in Israel were set deliberately by Palestinian terrorists, it would not be the first time arson has been used as an act of terror. In February 2009, Mervyn F. Bendle used the term "bushfire jihad" to describe fires raging in Victoria, Australia, which he argued were the result of an act of "pyroterrorism," exacerbated when three fires combined into one and burned for weeks. After the Australian fire, Daniel Pipes began documenting the increasing use of fire as a jihad tactic, especially in Israel. But most of these attacks have involved small-scale arson. The fires in Israel suggest a much more widespread and orchestrated attack. Something very much like what some are (perhaps prematurely) calling the "Arson Intifada" was conceived in the late nineteenth century by Jeremiah O'Donovan Rossa (1831-1915). Rossa, a founder of the Irish Republican Brotherhood (a forerunner to the Irish Republican Army), went into exile in New York City after being released as part of the Fenian Amnesty of 1870 and dedicated himself to the achievement of Irish independence through violence, or what was called at the time "propaganda by the deed." 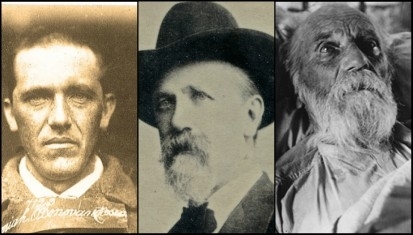 Jeremiah O'Donovan Rossa spent his life fighting for Irish independence. In provocative columns for the (short-lived) New York weekly Irish World in the 1870s (excerpted in the paper's subsequent disavowal), Rossa introduced the concept of hit-and-run arson attacks by what he called "skirmishers" – clandestine attackers, masquerading as civilians. A "small and resolute band of men, say ten or a dozen" could terrorize England on a night when "the wind was blowing strong," he maintained. "In two hours from the word of command, London would be in flames, shooting up to the heavens in 50 different places." This initial conflagration of fires would surely overwhelm and distract London's response teams. "Whilst this would be going on, the men could be still at work. The blazing spectacle would attract all eyes and leave the skirmishers to operate with impunity in the darkness." Rossa called for skirmishers to work with "each man setting about his allotted task, and no man, save the captain of the band alone, knowing what any other man was to do," anticipating the modern practice of horizontal cell-based terrorist groups. He understood that Irishmen had a critical advantage over other enemies England faced. "Spaniards in the days of the Invincible Armada, and Zulus today, could not do what English-speaking Irishmen can accomplish...our Irish skirmishers would be well-disguised." Like the skirmishers, the Palestinian terrorists "from long residence in the enemy's country know [its] cities well," operate in cells, and have learned to multiply the confusion and chaos of their attacks by hitting multiple targets simultaneously or by staging multiple bombs on a single target. A premeditated arson campaign suggests a further crystallization of these lessons. Which Palestinian terrorist group hasn't noticed what the fires of November did to Israel? Prime Minister Benjamin Netanyahu has acknowledged that the fires are "terror in every way," vowing that the arsonists/terrorists will be punished. He will surely accomplish that. When Israel built a barrier to keep out suicide bombers, missiles began flying into the country. When Iron Dome stopped most of that threat, multiple and unpredictable knife attacks began. Vigilant citizens and active policing have since diminished that threat. Now that we have seen how effective and devastating a pyroterror event can be, the larger challenge will be figuring how to prevent Palestinian skirmishers from wreaking havoc. For which Palestinian terrorist organization has not noticed what the fires of November did to Israel? A genuine fire intifada will be difficult to combat.